It is not always possible to take your dog to visit friends and family, always plan ahead and book your dog walker/sitter well ahead of time. It’s not fair to leave your dog with just anyone so choose carefully (see our blog on choosing a dog walker/daycare provider here) and make sure that your dog is happy and comfortable around whoever you choose to leave them with. 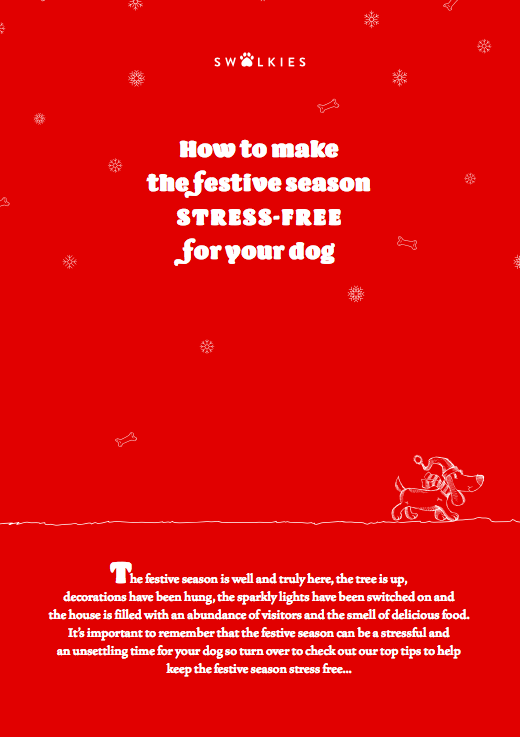 Dogs thrive on routine so it is important to keep their routine as normal as possible over the festive season. It can be tricky to stick to your normal routine, even when you’re full of pigs in blankets, your dog should still get their regular walks and training interaction. Maintaining their feeding, training and exercise routine will help to keep them calm and happy. During Christmas we often get more deliveries than usual, If you know that your dog normally reacts to the doorbell by barking then it may be a good idea to get your parcels delivered to another location such as work or put some training management in place prior to the festive season to help keep your dog calm when the doorbell rings. As fun as it is to have a house full of visitors, this can be an overwhelming time for your dog. If your only alternative is shutting the dog off in a different part of the house make sure you provide them with water, a comfy place to sleep and something to do such as a stuffed Kong® or a Snuffle Mat® filled with yummy treats. If your guests bring their dog with them, always supervise the dogs together and use your judgement on how the dogs are getting along. It’s a good idea to check that a present does not contain anything remotely edible before placing it under the tree. Leave presents that include chocolate, sweets or mince pies out of reach of your pup, as we all know that chocolate and currents are toxic to dogs. This goes for chocolate tree hanging decorations, nobody wants a sick puppy on Christmas Eve. It’s always nice to offer your dog an extra tasty treat over Christmas but be careful what you choose to give them. Turkey and other meats can contain bones that are dangerous and can get stuck or cause blockages to their digestive systems. Our human food can be so rich and salty that it may upset their sensitive tummies so a good idea is to create your own dog friendly Christmas dinner and stuff it in a Kong® to give to your dog while you tuck into your Christmas dinner. We'd also encourage you to resist feeding the dog from the table.....give them an inch at Christmas, and they'll come to expect it. It can be worth dog proofing your decorations, avoid hanging breakable decorations on lower branches of the tree, this goes for tinsel and Christmas lights too, we don’t want to tempt our dogs to play with them. If you have a real tree clean up the dropped needles regularly, they are sharp and can get stuck in your dogs paws. Some Christmas plants such as ivy, holly and poinsettias can be toxic to your dog, so keeping these out of reach up high on a unit or shelf is a good idea. Many people let off fireworks over the festive season and, of course, at NYE. If you have a dog that is sensitive to the noise of fireworks, don’t leave them on their own when you go off for your NYE celebrations. If your dog shows signs of stress and fear (panting, trembling, frequent yawning and lip licking, running around the house barking at those strange noises, etc. ), remain calm and offer support depending on what your dog finds calming. This can be cuddles, a relaxing doggy massage, providing a place to ‘hide’; this could be at the base of the sofa with your legs to shield him or submerged amongst a pile of blankets, etc. For some dogs, training exercises are a welcome distraction, although some dogs may be too stressed to be able to focus on training. Adaptil® plug-ins and a deliciously stuffed Kong® chew toy in preparation are also a helpful tool. Don't forget to buy a present for your dog! We don’t need an excuse to spoil our dogs, especially at Christmas. Wrap up their gifts or make them their own stocking. Allow them to enjoy the present madness in the morning. WISHING YOU A WONDERFUL CHRISTMAS! !